Dog shots prevent your poodle from contracting infectious diseases like rabies or distemper. Your puppy gets the shots so he won't come down with the disease. Vaccines help him from getting sick. Vaccinations are either essential, non essential, or not recommended. Your vet will help you learn which ones your poodle must have and why. 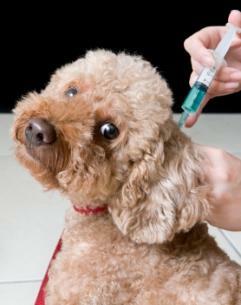 Sometimes, poodles have reactions to dog vaccines or are over vaccinated. Clear communication between you and your vet is necessary. Keep your pet at the vet for 60 minutes after her shots to make sure there are no adverse reactions. As a general rule, his first vaccine is at 8 weeks old and approximately every 4 weeks he will need to get another one up until he is 16 months. This is not set in stone as many booster shots that were previously given every year can remain effective for 7 years. These include the parvovirus, distemper and hepatitis vaccines. Make an appointment with a vet before your puppy comes home. Take him to the vet the first day or two he is home. Your vet will examine him, including his teeth, to make sure he is healthy, and set up his vaccination schedule. Ask your breeder what dog shots she has already had. Take your pooch to the vet when he is 6 months old for a tooth checkup. He'll check to be sure his adult teeth have come in properly. This is the time to begin weekly tooth brushing at home. Then your poodle will need to go in for an annual checkup. Some vets do blood tests, check his thyroid and his teeth at his yearly visit. The following diseases can be prevented by vaccinations. These are the core vaccines and protect against fatal diseases. Rabies is fatal, in saliva and spread through a bite or when saliva connects with an open skin wound. There is no treatment or cure if your dog gets rabies. Rabies shots are required for all dogs and is effective for up to 3 years. Canine parvovirus is very contagious. It can be fatal to puppies. There's the diarrhea type which causes bloody diarrhea and the cardian type which affects the heart muscle and is often fatal. Coronavirus causes vomiting and diarrhea. Treatments exist for both, but are not always effective. Dog distemper is caused by a virus and causes coughing, fever, vomiting, diarrhea, loss of appetite and weight loss. It can be fatal in young puppies under 6 months of age. It's very contagious. Adult dogs 6 and over are also at risk. Be sure your pet gets his distemper vaccine. Other diseases that dog shots can prevent include hepatitis, lyme disease, leptospirosis and canine cough. Ask your veterinarian if your dog should be vaccinated. 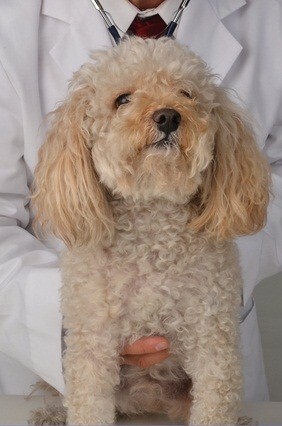 Hepatitis causes lethargy, fever, abdominal tenderness, vomiting and diarrhea in your poodle. Lyme disease is caused by ticks which have a bacteria. When the tick bites a dog, it transmits this to your dog. The disease causes swollen joints and dogs have trouble walking. It can also cause lethargy and loss of appetite. Antiobiotics may treat this. Leptospirosis is a disease which affects your poodle's internal organs. It's caused by bacteria and can be passed on to humans. Mice, rats and other rodents are carriers. It gets into your dog's mucous membranes and quickly spreads in his body. Canine cough, also known as bordetella or kennel cough, is a dry cough caused by a virus which may last a few weeks. It can turn into bronchitis. Kennels may require this vaccination before boarding your pooch. 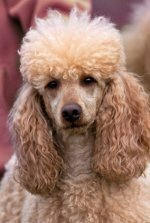 Dog shots protect your poodle from serious illness and debilitating disease. 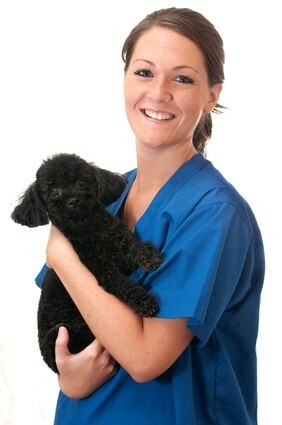 Be proactive and keep your poodle on a schedule to receive the vaccines that he needs.